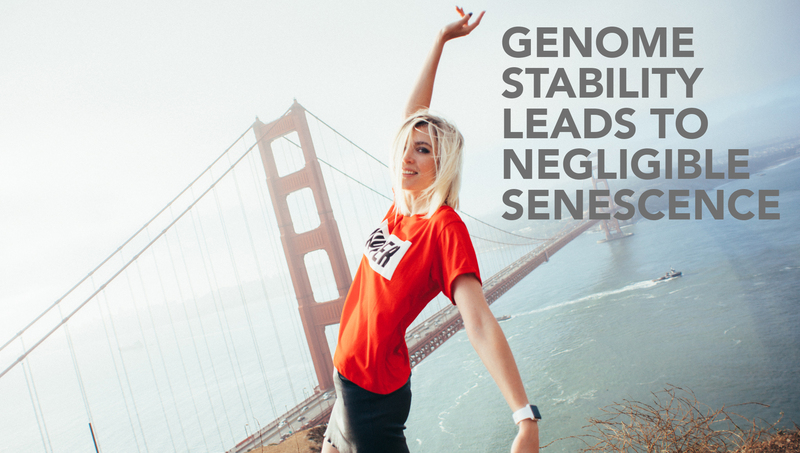 What would you say if I told you that aging happens not because of accumulation of stresses, but rather because of the intrinsic properties of the gene network of the organism? I’m guessing you’d be like: o_0. So, here’s the deal. My biohacker friends led by Peter Fedichev and Sergey Filonov in collaboration with my old friend and the longevity record holder Robert Shmookler Reis published a very cool paper. They proposed a way to quantitatively describe the two types of aging – negligible senescence and normal aging. We all know that some animals just don’t care about time passing by. Their mortality doesn’t increase with age. Such negligibly senescent species include the notorious naked mole rat and a bunch of other critters like certain turtles and clams to name a few. So the paper explains what it is exactly that makes these animals age so slowly – it’s the stability of their gene networks. 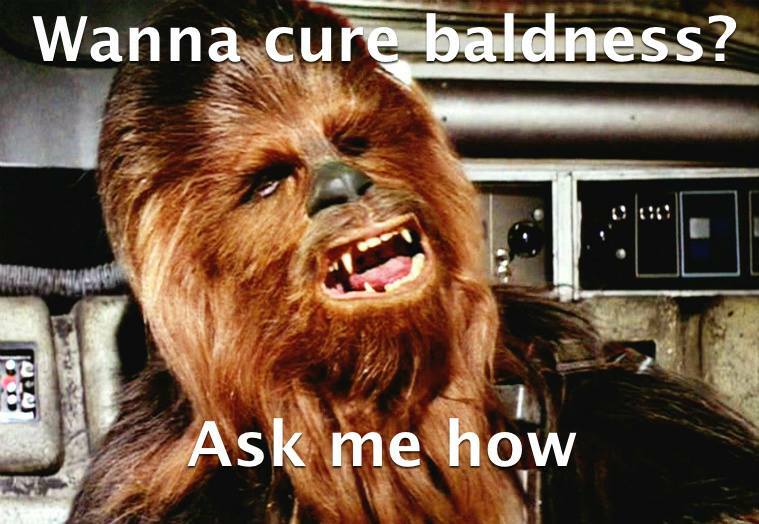 Meanwhile there is something important going on in the fight against baldness. As in the majority of tissues, the hair follicle has stem cells. There are two types of stem cells that are responsible for the continuous renewal of the follicles. The first type is called active stem cells and they start dividing quite easily. Stem cells of the second type are called quiescent and in case of the new hair growth they don’t start dividing as easily. At the same time, the new hair is based primarily on quiescent cells, which attracted close attention of researchers to these cells. At first people thought that baldness was due to this type of cells. The mTOR Story Part 1 – What Makes This Important Pro-Aging Molecule Active? I have mentioned mTOR as one of the main aging genes on multiple occasions. It’s about time I tell you what it is, what it does and why it is so important in aging. mTOR has a little m in front of TOR, which means I am speaking about mammals. It technically means «mechanistic» TOR, but think of it as the molecule that mice and all of us have, whereas in worms is it just TOR. mTOR gene produces one mTOR protein that can act in two pretty different ways. mTOR does so, because it forms two complexes with other molecules. These complexes are called mTORC1 and mTORC2. Yeah, I know, it’s a lot of letters, but C1 and C2 stand for «complex 1» and «complex 2», so it kinda makes sense. So, how are these complexes different? For starters, they have different proteins that are part of the complexes, and these differences define the drastic variance in functions. 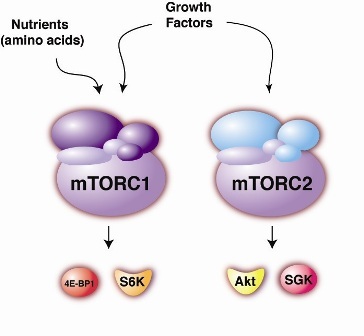 mTOR is one of the most studies genes that the scientists have known about for decades, however we still don’t know much about how those complexes react to different signals in the cells, especially mTORC2. We know much more about what the first complex does, but not really a lot about the second complex. This is not good, because both of them play a huge, enormous role in aging and in age-related disease like cancer and metabolic disorders like diabetes. Accumulating evidence suggests that microbiota plays an important role in modulating lifespan. This makes possible to use symbiotic bacteria as “living drugs”, which live in the host organism and promote its longevity. We propose to create bacteria, which dramatically extend lifespan of its host. Such bacteria have to produce not one, but a set of longevity-promoting substances with optimal concentrations and dynamics of secretion. To obtain such bacteria we propose to use directed evolution, a process that mimics Darwinian selection on a laboratory scale. This approach has never been applied to drug development before. Directed evolution enables simultaneous modulation of a number of bacterial metabolic pathways andsubsequent selection of the most effective longevity-promoting variants. Experiments will be conducted on a model system consisting of C.elegans and its intestinal symbiont E.coli. Due to highly conserved aging pathways, obtained bacteria may be further used to develop longevity-promoting human drug. Bacteria E.coli serve as the food source for C.elegans, but at particular stages of the nematode life course they can also exist as intestinal symbionts. Moreover, it was shown that E.coli influence physiology and lifespan of C.elegans. It was revealed that several mutations in E.coli genome increase or vice versa reduce the nematode lifespan. There are tree lectures about the mitochondria in my course. Dr. Pinchas Cohen, the Dean of Davis School of Gerontology, talked about the role of mitochondria in disease and pathology. Mitochondria have essentially three major functions. They are responsible for cellular respiration, integration of apoptotic signals, which means they control cell death, and production of reactive oxygen species (ROS). Mitochondrial function declines with age as a result of accumulated mutations in the mitochondrial DNA. Mitochondrial disfunction is common in diseases, such as diabetes, neurodegenerative pathologies and cancer. Interestingly, Dr. Cohen mentioned that there were only three Nobel prizes for research in mitochondrial biology. He anticipates that quite soon there will be a Prize awarded to mitochondria research. Mitochondria are very different in different tissues. They vary in size, numbers, histologically and in proteins they have. Energy production levels also vary quite significantly. This is due to differences in cellular environment in different cell types. Mitochondria adapt to the surrounding situation. Mitochondrial DNA can be used to track ancestral origins of the population. For example, all Ashkenazi jews, and there are approximately 8 million of them on the planet can be tracked down to 4 Italian women who lived around 2 thousand years ago. There are numerous diseases associated with mutations in mitochondrial DNA. It is absolutely not clear why so specific phenotypes are associated with given mtDNA mutations. For exapample, the DEAF 1555 mutation is extremely rare (only 50 families in the world) and only affects the inner ear and nothing else. It causes deafness. However a close mutation is more widely spread and causes both deafness and diabetes. It is absolutely not clear why this happens. The most common mutation is MELAS 3243. It stands for myopathy, encephalopathy, lactic acedosis and stroke-like episodes. The severity of pathology differs significanly in individuals who have this mutation. Some may only have mild metabolic disfunction, but others would have severe diabetes. ADPD mutations contribute to Alzheimer’s and Parkinson’s diseases. There’s also a whole cluster of mutations responsible for elevated risk of getting prostate cancer. There are mutations responsible for muscle/cardiac/renal and neuro abnormalities and autism-spectrum disorders. Dr. Cohen believes that upto 90% of healthcare costs can be reduced by diet and exercise. Unfortunately, lifestyle changes are rarely enforceable. Mitochondrial dysfunction is recognized to be a contributing factor in malignancy. Specifically, it relates to a transition from aerobic to glycolytic metabolism, resistance to mitochondrial apoptosis, accumulation of mitochondrial mutations and increased levels of mitochondrial transcripts of various lengths in certain cancers, in particular from the 16S rRNA. Diet and excersise significanly improve mitochondrial function. There are also 3 drugs that are PPAR-gamma agonists that improve mitochondrial function. As do drugs like GLP1, insulin and metformin. Of course, it is not a good idea to supplement yourself with insulin, however metformin seems very promising, especially given the recent publication where patients who have diabetes and take metformin have better survival curves than healthy controls. When UCP-2 protein levels go down, mitochondrial function is impaired, because the glucose/fatty acid metabolism ratio is changed. 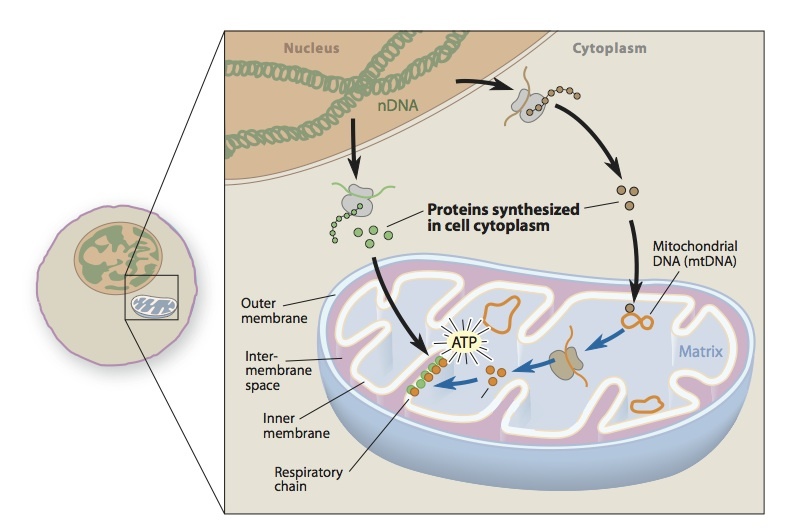 A recent paper showed that mitochondria trancriptome is in fact very interesting and further studies may shed light onto the so far unknown mechanisms of mitochondria function regulation. For example, this paper showed differences in the 13 protein expression ranging from organ to organ. There were also sense and anti-sense RNA detected, as well as small RNAs with unclear roles. Apparently there’s much more to the story of mitochondrial genome and its function that we now understand. There was a paper by Andrew Dillin and his team that posited there are mitokines that are secreted in the brain, but operate in the gut. It is not known though what mitokines are. Mitochondria do produce small peptides that influence cellular function. Dr. Cohen has discovered a peptide called humanin. Apparently, higher levels of humanin are associated with less Alzheimer’s disease and less cardio vascular disease. IGF1 decreases humanin levels. More research should be done in mitochondria-derived peptides, since it seems that they may play quite important role in aging and disease. On a side note when talking about diabetes Dr. Cohen mentioned there are only 5 types of diets: reduced amino acid intake (less meat), reduced carbohydrate intake, reduced fats, low calorie diet and intermittant fasting. He believes that it may be a good idea to adjust one’s diet according to the certain disease risks. For example, if a person has elevated cancer risk, then they should consume less amino acids, and those with higher cardiovascular risks may want to stay away from carbs-enriched foods. These are of course speculations. The only diet that was proven to be beneficial in terms of reducing disease risk is the Midetteranean diet. Performing the experiment described below will secure winning the Homeostatic Capacity half of the Prize. The probability of the proposed study to demonstrate significant improvement of the heart rate variability marker is extremely high, because parabiosis was already shown to promote functional parameters of the nervous and cardiovascular systems. Now, by using a young clone we can reduce all possible immunological adverse reactions to the minimum and see how the old animal rejuvenates because of the circulating systemic factors produced by the young clone. Check out the detailed prize-winning study description here. One of the most productive paradigms of aging suppression is based on rejuvenation of blood-borne systemic regulatory factors. Parabiosis, which is characterized by a shared blood supply between two surgically connected animals, may provide such experimental paradigm. We propose to use heterochronic parabiosis, the parabiotic pairing of two animals of different ages, for old mouse rejuvenation. 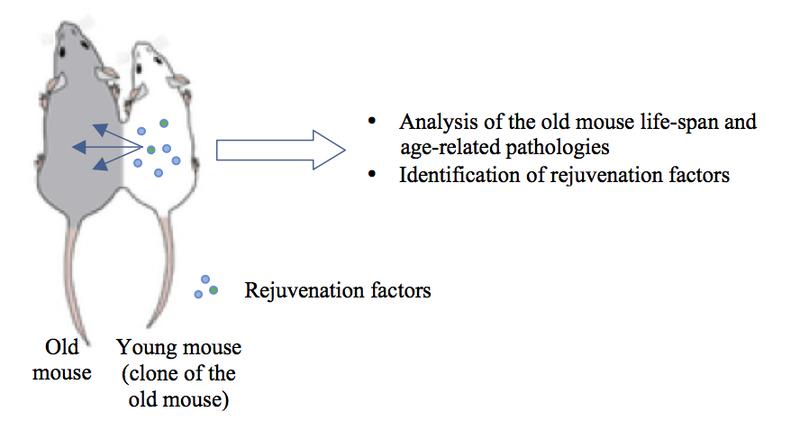 Heterochronic parabiosis also provides an experimental system to identify systemic factors influencing the aging process of the old mouse and promoting its longevity. The optimal rejuvenation effect of heterochronic parabiosis can be achieved by using cloned (genetically identical) animals. This will help avoid potential side effects caused by immune response. The early reported studies that used heterochronic parabiosis in rodent models to study lifespan regulation provided evidence of significant benefit to the older parabiont (reviewed in Conboy et al., 2013; Eggel, Wyss-Coray, 2014). Heterochronic parabiosis resulted not only in lifespan extension of the older parabiont (Ludwig & Elashoff, 1972), but it also promoted functional and regeneration potential in the aging central nervous system (Ruckh et al., 2012; Villeda et al., 2011), muscle and liver (Conboy et al., 2005), reversed age-related cardiac hypertrophy (Loffredo et al., 2013) and some other age-related parameters. Thus heterochronic parabiosis experiments indicate that blood-borne signals from a young circulation can significantly impact the function of aging tissues. The implication of these findings is that old tissues might make their function almost as well as young tissues if, by means of systemic influences, the molecular pathways could be ‘rejuvenated’ from an old state to a young state. The optimum rejuvenation effect of heterochronic parabiosis can be achieved using genetically identical animals. Genetically identical non-model organisms of different age can only be obtained by cloning. Interestingly, that there are no investigations of heterochronic parabiosis of cloned animals. The aim of the project is the comprehensive investigation of rejuvenation potential of cloned mice heterochronic parabiosis. At first we will perform cloning of adult (1-year-old) mice using technique for improved success cloning rate (Mizutani et al., 2014). Pair of cloned young and old heterochronic parabionts. Pair of young and old heterochronic parabionts (not cloned). Pair of two young parabionts. Pair of two old parabionts. The parabiosis is established at the age of 18 months for old partners and 2 month for the young ones. The detailed life span assay reveals the influence of heterochronic parabiosis with young clone on cardiovascular, nervous, respiratory, skeletal and muscular systems. The lifespan assay shows the young clone parabiosis impact on longevity of older partner. In addition, systemic factors, which influence the aging process of the old mouse and promote its longevity and rejuvenation, are revealed. Mitochondria vary from 0.5 to 10 micrometers in size. Their outer membrane is freely permeable, it let’s in and out proteins less than 5000 daltons. The inner membrane, however is tightly regulated, nothing gets in or out without the special transport. Inner membrane forms cristae that curve inside to maximize the surface for energy production. Radical life extension is the optimal strategy for everybody. Ways to fight aging. How to get a ticket to the future. Exception to Several Theories of Aging - Why Do Naked Mole Rats Live So Long?